Marine Corporeal Jeffrey DeYoung could barely hold back his tears as he accepted the folded American flag in honor of Cena. Five-hundred people were attending his funeral, all Marines in their dress blues. Cena had been raised to be a Marine since he was very young, and during his tours in Afghanistan, he’d saved thousands of lives. “There’ll never be another like you.” DeYoung listened to the taps performance as the coffin was lowered into the grave escorted by eight German shepherds. Then, on command, they issued their own salute to their fallen comrade, howling for thirty seconds. Cena fell, not in the service of his country, but to bone cancer. The Michigan war dog was interned with seventeen other military canines. This weekend, we mourn our honored dead in the United States Armed Forces, but never forget the most dedicated and loyal members of the service are not always human. 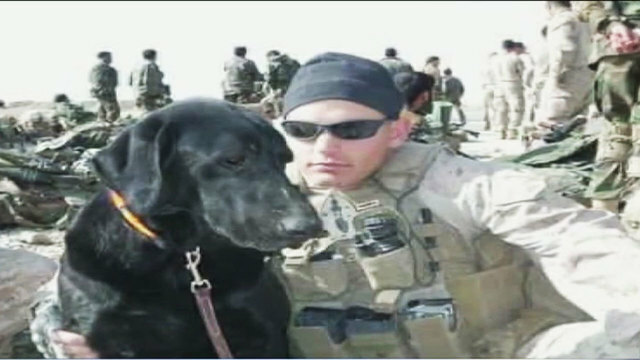 Cena with his handler Marine Cpl Jeffery DeYoung – Photo Credit: Fox 2 News. I wrote this for the Sunday Photo Fiction – May 27, 2018 writing challenge. The idea is to use the image above to inspire the creation of a piece of flash fiction no more than 200 words long. My word count is 151. 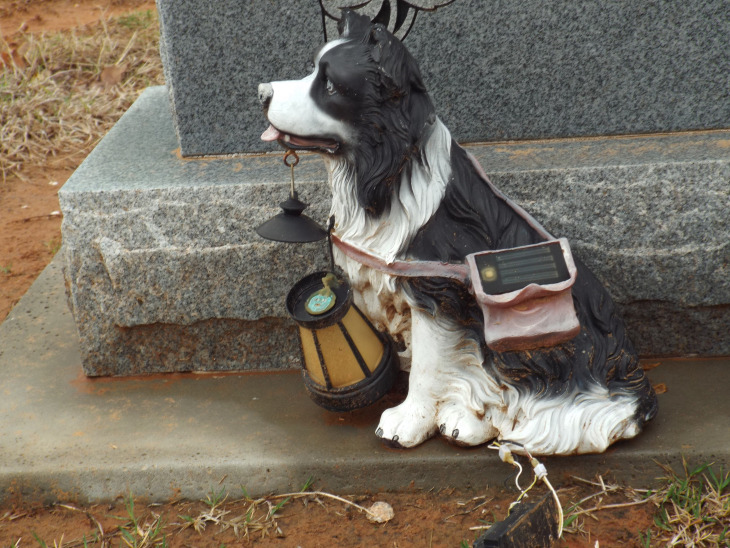 Given that this is the Memorial Day weekend in the U.S., and seeing the prompt was a photo of a dog and a headstone, I thought it fitting to pay homage to the dogs who have served our country. My tale is a fictionalized version of the events in the news story Michigan bomb-sniffing war dog gets military funeral. On August 24, 2017, Cena was buried with full military honors at a cemetery in South Lyon, Michigan. You can click the link to get all the details, but it’s very touching. In doing my research, I also found a book on the history of military dogs, as well as this commentary. Nicely folding the prompt into the memorial, these dogs truly are heroes too. Don’t underestimate this story. It is very well done and most appropriate for Memorial Day Weekend. A fine tribute to those who defend their country. I suspect that dogs have hunted and gone into battle with humanity since man first learnt to walk. There’s some evidence to suggest that dogs were first domesticated 15,000 years ago in Europe, so you’re not that far off, Mike. Our canine heroes are often forgotten because well, they are just dogs. NO! They give out of obedience and love and are beloved soldiers. I recall reading about search and rescue dogs lost after 9/11. Sobering. My Dad once told me that no person will ever love you like a dog will love you. He was a really big dog person. Oh, he and Mom were married well over 60 years when he passed away, so he loved Mom, too. This is a story I found on a local news website: 5,000 military dogs went to Vietnam; not a single one came back. Now, they’re being honored. Beautifully done. So many heroes are forgotten. I am glad he’s not.